Some help with mystery plants? I just moved to this house a couple months ago. There is a large growth of weeds and such underneath some weeping pines on one side of the backyard, and only recently I noticed that a lot of them don't look like weeds. They even look like they could be herbs, or something that might look nice in a garden, have medicinal uses, or grow into a nice tree. So maybe you could help me with IDing them? The only thing I don't want to hear is "they're just weeds", even if they are technically 'weeds', I'm sure they have names, and I'd like to know them. I mean, dandelions are weeds, but I think they're kinda pretty, they are a wonderful food for tortoises, and they even contain some good nutrients for humans. So, thanks for any ideas! Oh yeah, I need to include pictures, huh... I'll get those up in a minute. This is a wide shot of the first plant i noticed. I'm told it gets little white or purple flowers in spring. A closer view of the leaf layout of the same plant. I'm not sure if this is the same plant as the first two. It's similar, but this one has darker leaves, and climbs all over the trees. Plus, I didn't see berries on the others. A big growth of the second plant (if it's different from the first) framed between a lilac bush and a pine. This is the same plant as the last one. This is a flower-looking thing, but I think may be an empty seed pod, that I only found near yellow leaves. 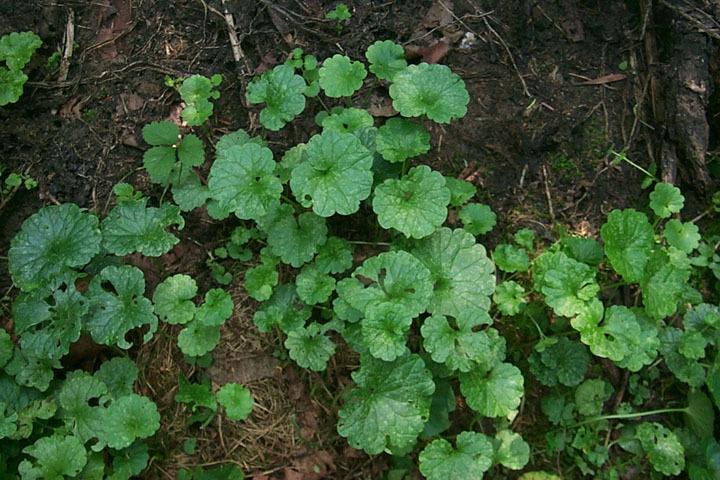 This one is similar to the first plant, but the leaves are paler and slimmer. Little flowers similar to chamomile, but the leaves are very different. This is a common weed I've seen a lot, and was just wondering if anyone knows what it's called. The third one down the vine with the red berry, I think is just morning glory or bindweed (wild morning glory). Either way it's an invasive pest, and you want to get rid of it. The one with the little white flowers is some kind of wild aster, I'm thinking probably calico aster. It's a little difficult to tell, but the first couple pictures look like they may be shoots from your lilac bush. Lilacs are not trees, like like to grow as huge colonies, so they send up new shoots all around the outside of the bush. That just leaves the little vine with seed pod, which I don't recognize at least from that picture. Re: Some help with mystery plants? PHOTO #1 "I'm told it gets little white or purple flowers in spring." If #1 and #2 are the same, I think it's a younger growth of a plant in the Solanum family. The buckshot holes could be typical fleabeetle damage. More likely the heart-shaped leaves of Solanum dulcamara (which I think are #3 and #4) -- purple flowers but more like in early summer, that develop into clusters of red berries. Solanum americanum (Deadly Nightshade) has white flowers that develop into black berries, but has leaves with wavy-edged-and-pointed leaves. Birds like both berries -- I usually have catbirds, mockingbirds, and cardinals fighting over these as well as the elderberries, mulberries, and pokeberries. 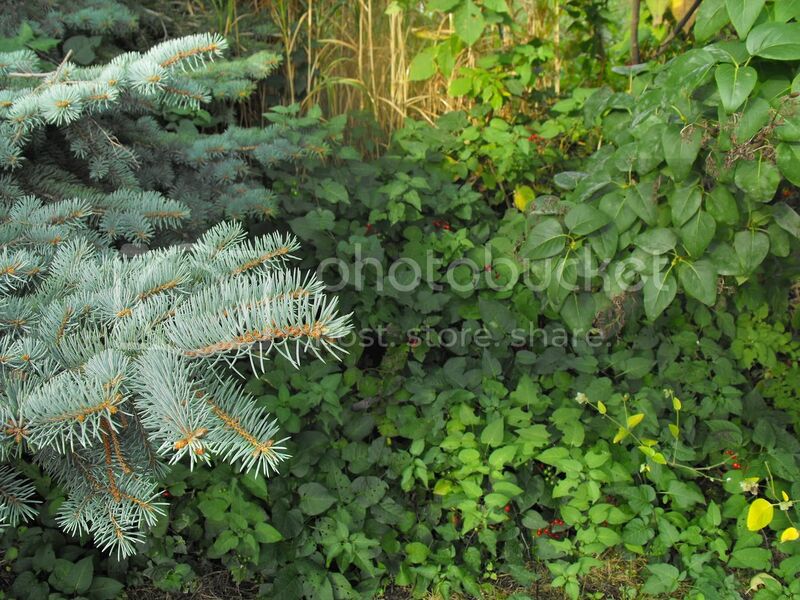 PHOTO #4 "A big growth of the second plant (if it's different from the first) framed between a lilac bush and a pine." I think the darker leafed plant in #3 and #4 with red berries is Bittersweet Nightshade (Solanum dulcamara) In particular, I'm noticing the leaf with large terminal lobe and 2 small lobes flanking it. This plant has 2 leaf forms, the heart shaped ones on younger growth and the 3-lobed form as the plant begins to vine. The bright red berry clusters look right too. PHOTO #5 "This is the same plant as the last one. This is a flower-looking thing, but I think may be an empty seed pod, that I only found near yellow leaves." 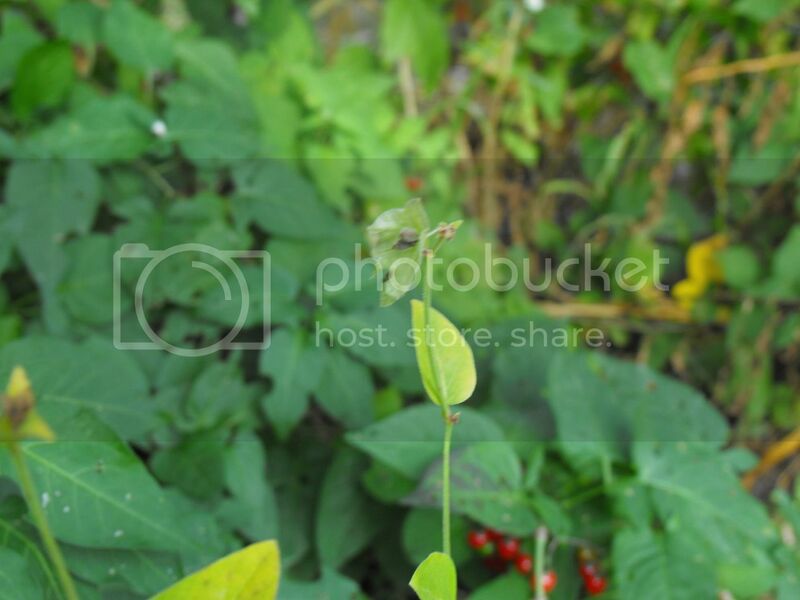 I'm assuming by this that you're talking about the yellowish leaved vine for this photo as well as PHOTO #4. Note that *I* was talking about the darker leafed plants. I'm not sure what the yellow leaved one is. I've a nagging feeling that I've seen it before, but I can't pinpoint it. I'm pretty sure Rainbowgardener is correct with this ID. Ground Ivy/Creeping Charley (Glechoma hederacea) It should have a pungent fragrance when crushed. Personally I really like it and allow them to grow in shady areas of the garden. The bees LOVE the purple flowers. They are relatively easy to pull out when unwanted, and take to mowing (and Ah! that fragrance!) BUT, they do re-grow from any remaining runners and set roots from cuttings so most people consider them an invasive nuisance. Note that I'm going by photos in Weeds of the Northeast by Uva, Neal, and DiTomaso, which is my WEED BIBLE -- I think I've practically memorized the entire book Depending on where you're located, the species ID's with latin names I supplied might not be the exacly the same. Thanks guys. ^_^ I'll look into this more. The picture with the yellow leaves is from the same plant with the red berries. We recently moved to Southwest Louisiana from Tacoma, Washington, and I don't believe this is a variety of Morning Glory because we had loads of it all over our property in Tacoma, which took me several years to eradicate!! To me, it looks to be an ivy, and I think it would be a good idea to remove it from your trees. Looks like deadly nightshade to me, rather than bindweed or morning glory. Based on my own experience with deadly nightshade, the leaves tend to be a simple heart-shape when the plant is young, and only develop the 2 small lobes at the base when the plant is more mature. I fight an endless and ongoing battle with deadly nightshade. It's as bad as, if not worse than, any bindweed I've fought in years past. I guess the problem is that it's growing up inside my neighbor's hedge, between two panels of welded wire. It's almost impossible for me to get at it to tear it out. The birds eat the berries and spread the stuff all over my yard. I do detest deadly nightshade! 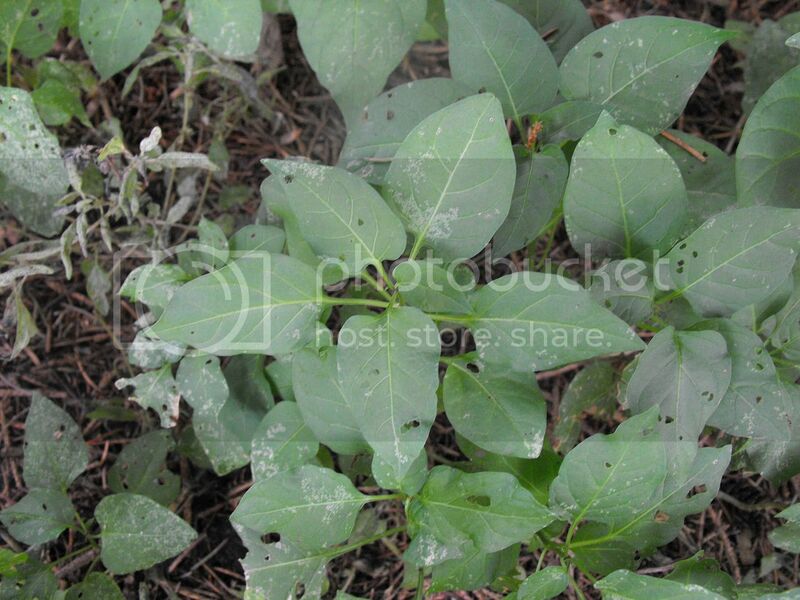 a0c8c, do the leaves on your vine look like this? 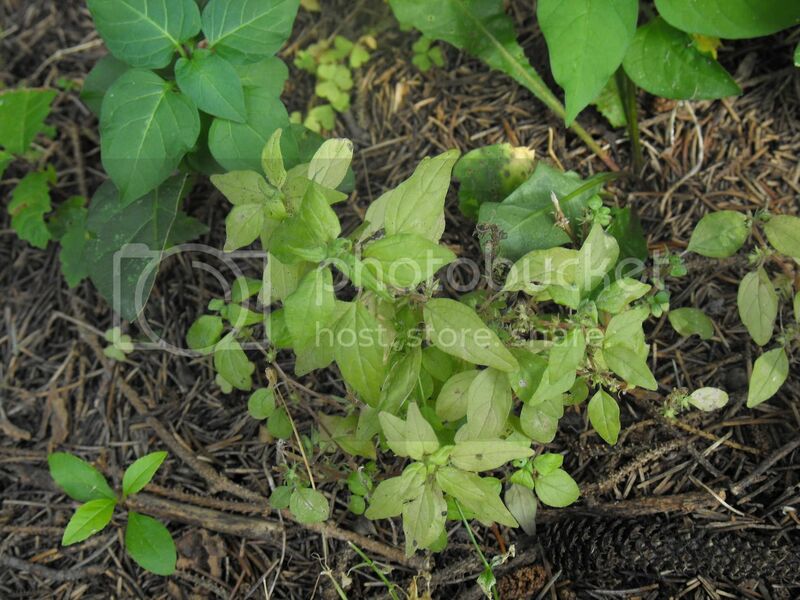 This is field bindweed, and the leaves are described as "shield shaped." It is slightly different from hedge bindweed, which has leaves shaped more like an arrowhead. Kisal wrote: Looks like deadly nightshade to me, rather than bindweed or morning glory. 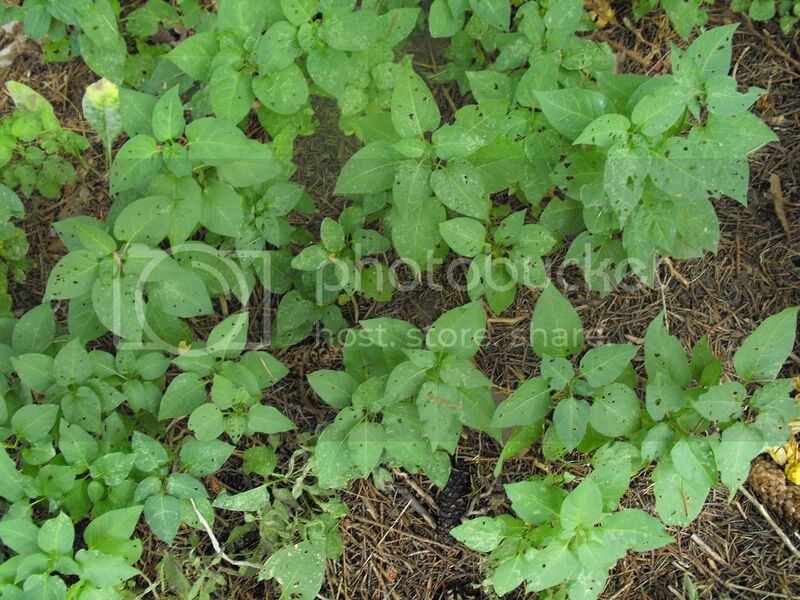 Based on my own experience with deadly nightshade, the leaves tend to be a simple heart-shape when the plant is young, and only develop the 2 small lobes at the base when the plant is more mature. I fight an endless and ongoing battle with deadly nightshade. It's as bad as, if not worse than, any bindweed I've fought in years past. I guess the problem is that it's growing up inside my neighbor's hedge, between two panels of welded wire. It's almost impossible for me to get at it to tear it out. The birds eat the berries and spread the stuff all over my yard. I do detest deadly nightshade! I don't think it is that plant.. the leaves on mine have much more visible veins, and seem thinner. Those look almost glossy. Notice the form of the leaf in the second photo on that page, especially the small lobes at the base of the leaf. Compare it to the leaf in the lower center of the third picture you posted, i.e. the leaf immediately to the left of the one with the brown tip. Do you see the small lobe at the base of the leaf? Although the leaf in your pic only has a single lobe at the base of the leaf, rather than one on each side, I believe that is because the vine is just beginning to take on its mature form. JMO, anyway. You're absolutely right, it is nightshade! My roommate, who's lived here longer, confirmed that those are the flowers it gets. Thank you! One plant figured out. I guess that means the other ones, the ones that don't climb but have similar leaves to the nightshade, are a different thing altogether. I'm told they bear small white flowers right in the middle of the clusters of leaves. Also, I want to point out that all these things are growing directly under some variety of weeping pine. I didn't realize this, but I guess pines are particularly acidic or something? Maybe that will narrow down the list of plants it could be. So, to refresh... I still don't know what the first two pictures are (same plant), or the second and third to last ones. I noted that the second to last, the one with the little daisy-like flowers, is not growing underneath the pines, but near them. It is almost under the lilac bush, and very near the nightshade. Also, in the picture with the large shrubby thing in between the lilac and the pine, do you think that entire growth is nightshade, or is the nightshade just climbing whatever the other plant is? I'll look more closely and see if I can separate the nightshade vine out from the other parts. I believe applestar and/or rainbowgardener correctly ID-ed those little daisy-like flowers for you as Daisy Fleabane (Erigeron strigosus). I think their other IDs are probably correct, too. 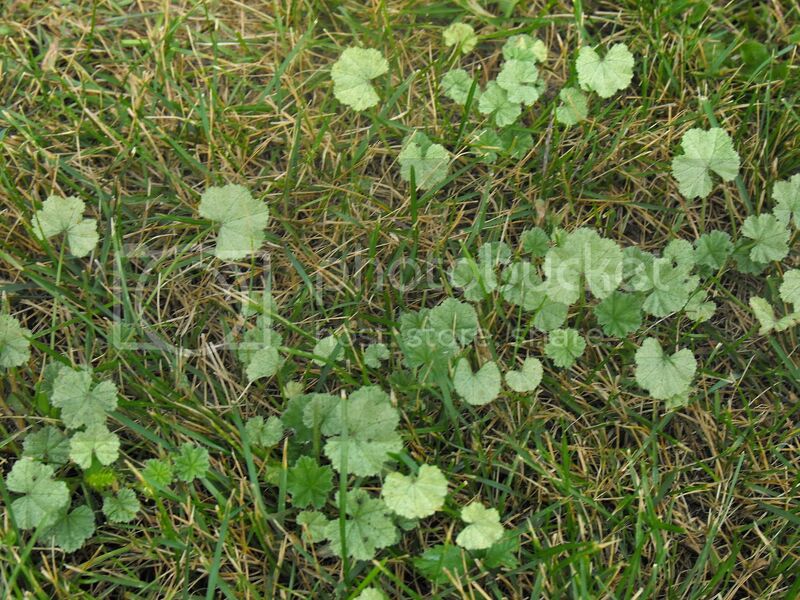 I also agree with Cynthia's ID of the last picture as Little Mallow (Malva parviflora). It can be very difficult to identify an herbaceous plant based solely on a photograph of the leaves. 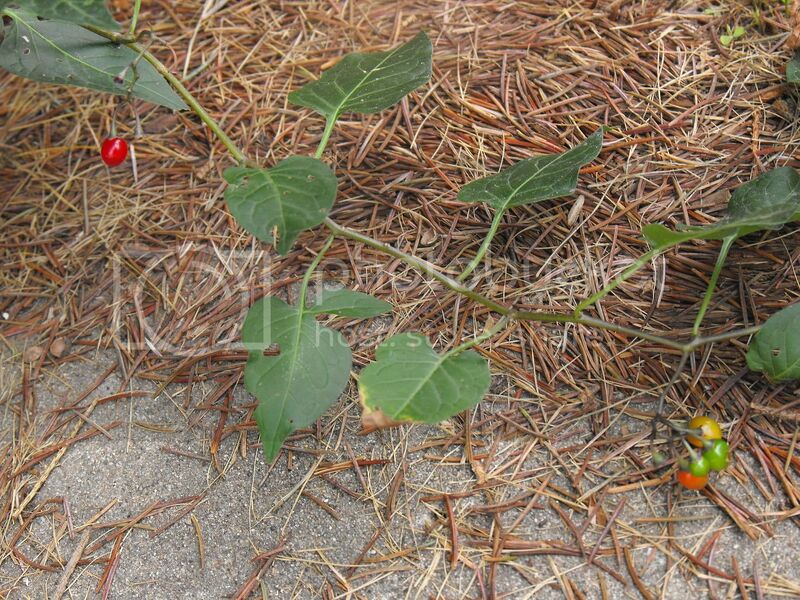 What is the difference between deadly nightshade and climbing nightshade? Which is which? Some people were thinking my plant was deadly nightshade... but I doubt it is that poisonous. Also, the pictures I've seen of deadly nightshade have very different flowers than the climbing variety. Then again, when I do an image search, some of the pictures that have the flowers that match mine say deadly nightshade... and some other pictures labeled deadly nightshade have the other flowers. This one is Atropa belladonna, deadly nightshade, correct? And this is climbing nightshade, Solanum dulcamara? Are the berries on deadly nightshade always black? In any case, it is the climbing nightshade which I have, not the deadly. Apparently it is only mildly poisonous, mostly the green, immature berries, and mostly to small animals. Edit: Looking back on earlier posts, and doing a little research... I am now thoroughly confused. Isn't Solanum americanum American black nightshade, not deadly nightshade? How poisonous is it? We're very close with the aster... But I'm not sure it's either calico aster or daisy fleabane. 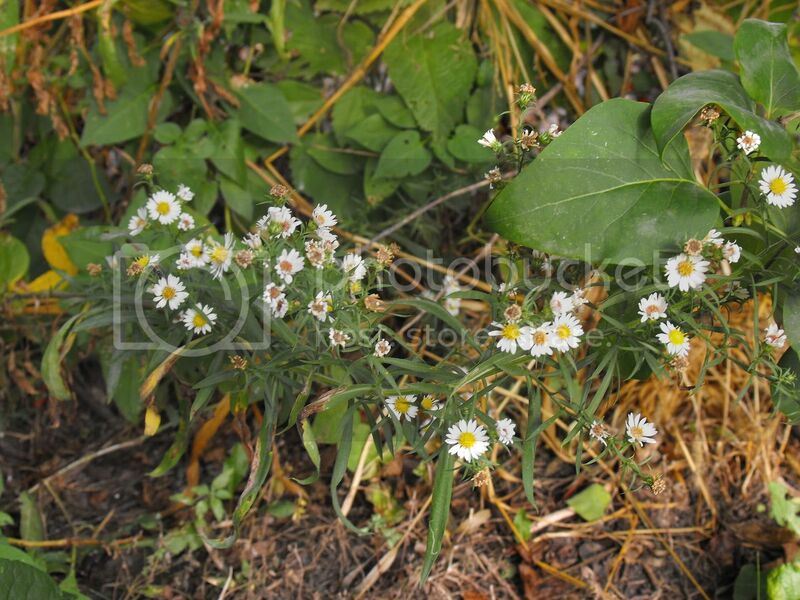 The petals of the calico aster are longer and more sparse than the ones on my plant, and the fleabane petals are much more string-like than mine. Also, the leaves are wrong for calico aster. They are very long and thin, almost like blades of grass. Kisal wrote: a0c8c, do the leaves on your vine look like this? 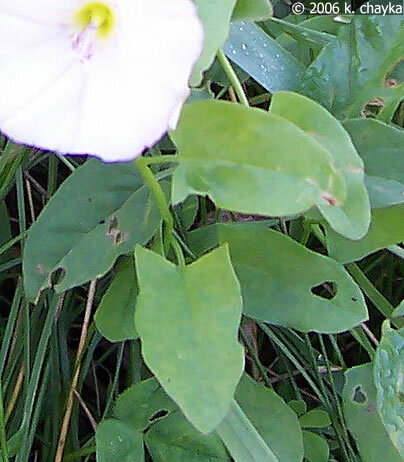 This is field bindweed, and the leaves are described as "shield shaped." It is slightly different from hedge bindweed, which has leaves shaped more like an arrowhead. Two more mystery plants -- please help ID?